Update 3: Google addressed the server-side issue late yesterday and it is no not looping from beta to stable back to beta. Update 2: Thanks to reader Aberr who is reporting that the looping is also happening on his Nexus 5X. Update: It appears that the beta build is the last beta build so devices are looping from beta to stable to beta. Sigh…. 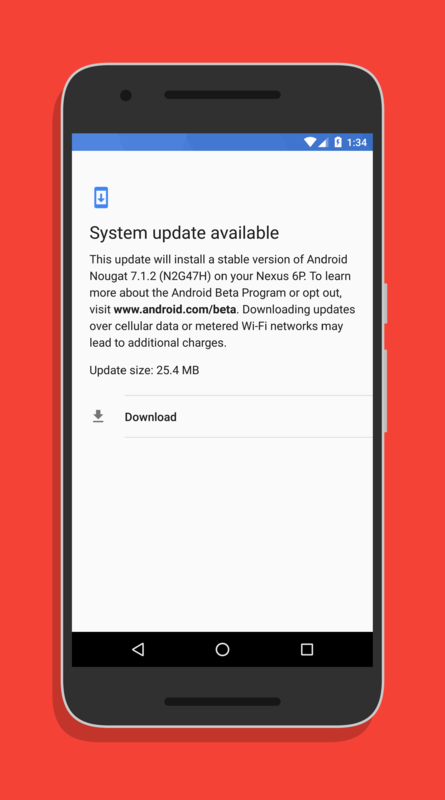 For those of you who participate in the Android Beta program and have a Nexus 6P, the GA build of Android Nougat 7.1.2 is now rolling out to devices. The update is just a touch over 25MB in size, indicating that the last beta and this final build were pretty much identical. You are looking for build N2G47H and so far, only the Nexus 6P seems to be updating to this new build. Those of you who texted on the Nexus 5X or Pixel C are still having to wait for the official build to hit your devices. If you are looking to get out of the beta, this is the time to do it. Once you have N2G47H installed on your Nexus 6P, you can then opt out of the Beta program and you won’t get a reset of your phone. If you move from the beta build out of the program, you will get a reset of your phone. And this little tidbit is important because there is already another beta build out. get out of the beta. Instead, go to the beta program page and remove your phone from the program. After that, reboot your phone and the beta build prompt will go away. Now you are on the official 7.1.2 build and will stay there unless you add the phone back to the beta program. Thanks Aberr. I’ve updated the post with your comments.